Hypothyroidism results from the absence or reduction of the synthesis of thyroid hormones. This may be caused by congenital absence of the thyroid gland, complete or partial surgical removal of the thyroid gland, an overdose of drugs that affect the thyroid gland damage as a result of inflammation or exposure to radiation (for example), the irradiation of the neck or chest X-rays carried out after previously untreated hyperfunction thyroid radioiodine). Hypothyroidism can also occur for reasons not related to the gland itself, namely as a result of damage to the pituitary or hypothalamus, which causes the absence or violation of production of hormones that stimulate the thyroid gland (TSH - thyroid stimulating hormone of the anterior lobe of the pituitary gland and TRH - Thyrotropin-releasing hormone) - secondary hypothyroidism. Manifestations hypofunction, regardless of the cause, are similar: slowing of metabolic processes in the body. In children, there is a delay in development. They have a distinctive appearance - open mouth, big tongue, dry, flaky skin. Often a symptom of a hypoactivity of umbilical hernia is a result of the weakening of the abdominal muscles. Hypothyroidism in adults gives so typical symptoms that an experienced doctor can diagnose it on appearance of the patient. The patient complains of a feeling of growing slow thought processes and movements (although the intellect remains intact) the skin becomes dry, flaky, there is a constant feeling of cold, often marked by impaired hearing, the voice becomes hoarse, muscles and joints are painful, the face, especially the eyelids, swollen, sometimes have swelling of extremities – so called hypothyroid swelling. The concentration of cholesterol in serum mostly increased, often marked by anemia. Untreated hypothyroidism can end tragically, the patient can go into coma, from which it is very difficult to recover. In Ayurveda, the traditional Indian medicine, plant & minerals are used to normalize the activity of the thyroid gland and affect the hormone balance. Ayurvedic herbs such as: Kanchnar, Musta, Bhumiamla, Guggul, Shatavari and others, in conjunction with minerals, effectively helps the body to normalize the production of hormones necessary to maintain their balance and create the optimum conditions for the health of the thyroid gland. All these necessary plants and minerals are present in the formula of Sattva Garmodin. Normalizes the production of thyroid hormones. 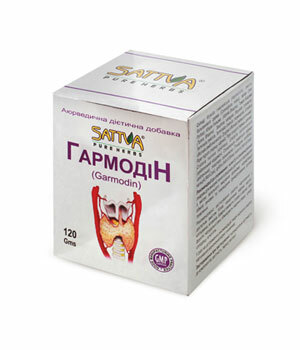 Normalizes the level of thyroid stimulating hormone (TSH) of the pituitary. Increases the metabolic processes in the body. Eliminates dryness and peeling of the skin. Kanchnar (Bauhinia variegata) - The bark of this tree is used from the trunk to the branches. It contains tannins, essential oil. It has anti-inflammatory, astringent, antibacterial, antiviral effect. One of the most famous ayurvedic plants. Used to treat tumors. Musta (Cyperus rotundus) - Ground almonds. The plant sedge family, originally from India. Rhizomes and tubers are used with up to 0.5% essential oil. The oil contains monoterpenes, tsiperen, tsiperol esters. It has antimicrobial, anti-inflammatory, anti-inflammatory, antipyretic, antispasmodic, analgesic effect. It inhibits platelet aggregation. It has anti-inflammatory effects associated with inhibition of arachidonic acid cascade. Musta stimulates digestion, improves absorption in the small intestine, and kills parasites. It has a diuretic and diaphoretic, strong astringent action. It tones the nervous system. Bhumiamla (Phyllanthus amarus) - plant of the family Euphorbiaceae. It has a wide range of pharmacological properties and contains a variety of biologically active substances, including lignans, terpenes, flavonoids, alkaloids, steroids, vitamin C, tannins and saponins. With this chemical composition, Bhumiamla has a strong antimicrobial, antioxidant, analgesic and anti-inflammatory action. Bhumiamla has choleretic and hepato-protective action. Used to prevent atherosclerosis and diabetes. It is used in the treatment of skin diseases and thrombophlebitis. It has a sour taste due to its high content of vitamin C. It normalizes the various functions of the liver, having a pronounced hepatoprotective and anti-inflammatory properties. Guggul (Commiphora mukul) - used gum (resin), which is formed from the milky juice of fruits guggul. One of the most widely used in plant Ayurveda. It has a strong purifying and antioxidant action. It stimulates the activity of the thyroid gland. Shatavari (Asparagus racemosus) - is used in Ayurveda for centuries. The plant is rich in bioflavonoids and natural antibiotics. It normalizes the function of the hormonal and immune systems. Ajwain (Carum copticum) - Annual spice plant, native to South India. It has a pungent and spicy flavor. Thymol, extracted from essential oil, used in medicine as an antiseptic, wound healing and anthelminthic. A strong stimulant of the digestive, respiratory and nervous systems. Improves metabolic processes, disturbed stagnant. Cumin seeds promote digestion. Gives energy, freshness, stimulate the nervous system, reduces acidity, have a diuretic effect, increases kidney activity. Relieves spasms of the small vessels of the skin. Guduchi (Tinospora cordifolia) - perennial vine traditionally used for strengthening the immune system, healing of wounds and injuries. Guduchi - a plant with a strong energy. Its name literally translates as "life-giving". It nourishes the body on all levels. In addition, this plant is thoroughly and effectively cleanses the body of toxins produced by pathogenic microorganisms and cleans the blood of ama (partial metabolic products). Guduchi - a powerful antioxidant. Guduchi has a relaxing, diuretic and diaphoretic action. Strengthens tissue and heart balances all systems of the body and cures a lot of diseases. Nirgundi (Vitex negundo) - Vitex Sacred. In Sanskrit "nirgundi" literally means "protect the body from disease." Since ancient times, Nirgundi is used not only in the food and for the treatment of humans, but also in the religious ceremonies. It is believed that resting under the x tree of Vitex negundo , and inhaling its aroma, the man gets rejuvenated. Wood has long been a symbol of chastity. People believed that the plant tones and rejuvenates the body. The plant releases a lot of volatile production, and even in winter its branches exude a pleasant aroma. It has anti-inflammatory, analgesic, anti-inflammatory, antiseptic properties. It relieves inflammation and swelling, soothes pain, improves circulation. It is used as an antipyretic, expectorant, diuretic and anthelmintic agent. Nirgundi releases toxins from the bones and joints and helps to remove them from the body. Holding back pain and numbness, reduces swelling. Nirgundi stimulates "the vital currents." Shilajit (Asphaltum) - «Balsam Mountains." - It contains a balanced set of biologically active substances: proteins, amino acids, lipids, fatty acids, macro- and micronutrients, vitamins group. It has a wide spectrum of pharmacological activity and provides amplification of the immune system. Used as a tonic, to increase strength, improve health and longevity. Loha Bhasma- Iron oxide (Ash of Iron) - stimulates all the organs and body systems involved in hematopoiesis. Increases in hemoglobin and protein anabolism. Rajat Bhasma - Silver oxide (Ash of Silver) - has a bactericidal action, provides high antimicrobial activity, the ideal anti-inflammatory agent. Suvarna Bhasma - oxide gold (Ash of Gold) - one of the main components of the drug. In the ancient Ayurvedic texts described the therapeutic use of gold. Gold, which becomes reddish as the rising sun when heated and becomes a light saffron hue when crushed in a stone mortar, it is considered useful for medical purposes in Ayurveda. All medications containing gold, in one way or another have properties Suvarna Basma, however, due to other components within the compositions are specifically directed action. Suvarna Basma is one of the best known rasayana - a tonic and anti-aging drug that slows down the aging process, improves the intelligence, memory, giving strength throughout the body and prolong life. It is an excellent antioxidant. Aphrodisiac. It has sustained tonic effect. Avoid heavy meat, fatty and fried food, sweets and alcohol. Use products that are easy to digest: all kinds of vegetables, whole grains, such as wheat, millet, buckwheat. Eat more seasonal fruits and vegetables rich in vitamin A and carotenoids. Reduce the consumption of dairy products, especially with high fat content. Good practice yoga and breathing exercises (Pranayama). Kanchnar (Bauhinia variegata), Musta (Cyperus rotundas), Bhumiamla (Phyllanthus amarus), Guggul (Commiphora mukul), Shatavari (Asparagus racemosus), Ajwain (Carum copticum), Guduchi (Tinospora cardifolia), Nirgundi (Vitex negundo), Shilajit (Asphaltum), Loh Bhasma (Ash of Iron), Rajat Bhasma (Ash of Silver), Suvarna Bhasma (Ash of Gold). hypothyroidism, decrease of metabolic processes in the body.